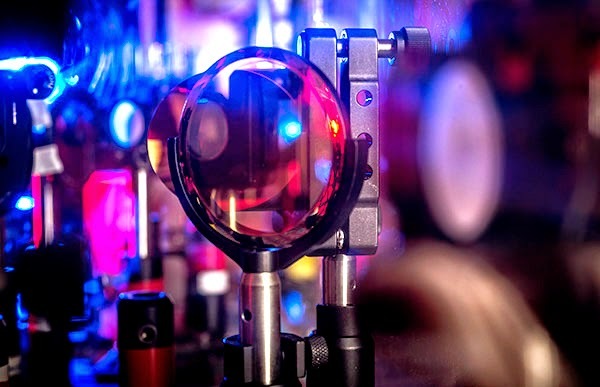 UAB researchers and colleagues have created an ultrafast, ultratiny on-off switch out of vanadium dioxide, a material that could be the future of high-tech. But before we get there, we'll probably need to answer this question: What in the world is vanadium dioxide, anyway? What's the fastest thing you can imagine? How about the smallest? 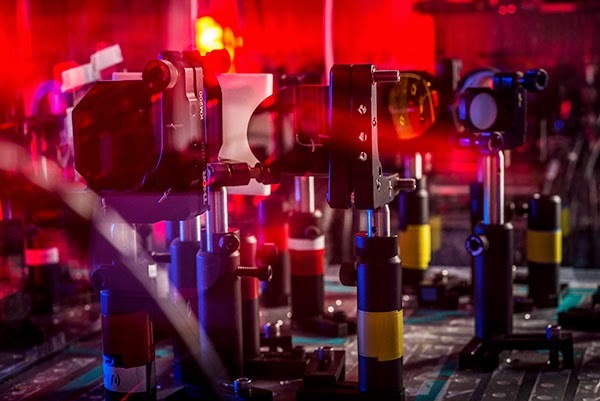 Well never mind, because there really is no way to wrap your head around what's going on in David Hilton's laser lab in the UAB Department of Physics. That is to say, you're about to find out what's going on, and it's amazing stuff. Hilton and one of his graduate students, Nate Brady, are hot on the trail of what might be the magic material of the 21st century: vanadium dioxide. This strange, manmade material could be the successor to silicon, paving the way to ultrafast, ultrasmall switches that will make the current information superhighway look like a slow drive down a country road. But all this is happening so quickly that it staggers the brain. 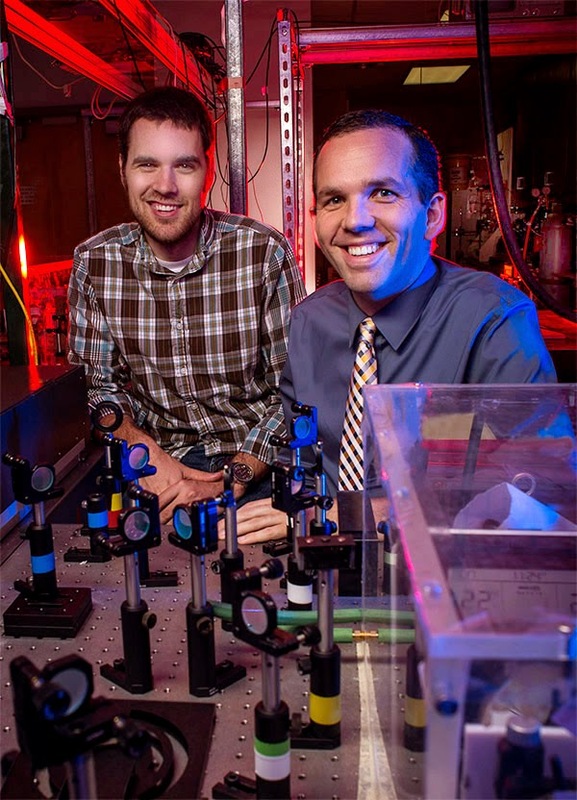 Nate Brady (left) and David Hilton (right) worked with researchers from Vanderbilt University and Los Alamos National Laboratory to create an ultrafast switch from vanadium dioxide, a manmade material with unusual properties. Vanadium dioxide, also known as VO2, has a curious characteristic: below 153 degrees Fahrenheit, it's an insulator; when it hits 153 degrees or higher, VO2 turns into a metal. "It changes from being transparent to being opaque," says Brady. "It's really cool, especially because it happens so near room temperature that it could be useful in a lot of devices." "You haven't been able to buy a processor faster than 4 gigahertz, mostly because it's going to melt in your lap," Hilton says. We may have reached the limits of silicon. And that's where VO2 comes in. 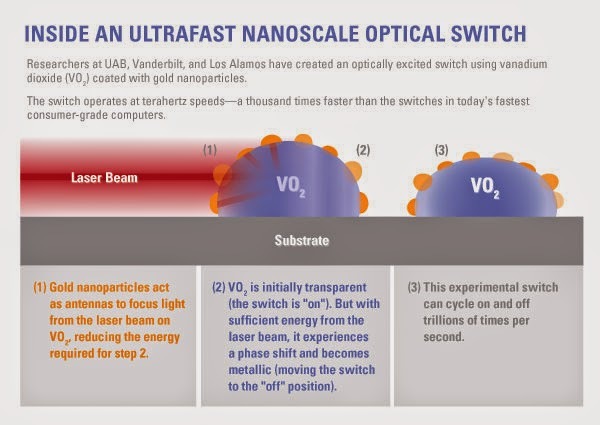 In the March 12, 2014, issue of Nano Letters, Brady and Hilton, along with collaborators at Vanderbilt University and Los Alamos National Laboratory, presented work showing they had reached terahertz speeds, or trillions of cycles per second, in a VO2-based switch. Just as important, they did it using as little as one-tenth of the energy required for previous VO2 switches. Hilton is quick to point out that this breakthrough is still a long way from your local Best Buy. "We've shown that we can flip one switch on that fast," Hilton says. "To build a processor, we'd need to show we can do a couple billion of them." Long before that point, experimental physicists like Hilton and Brady will have given way to scientists at Intel and other major manufacturers. But right now, Hilton and company are still trying to answer their burning question: What causes vanadium dioxide to change from insulator to metal, anyway? We humans have a pretty firm grasp of how long a second is. (The word "Mississippi" is often involved.) But a second is built from milliseconds, or thousandths of a second. Remember when U.S. swimmer Michael Phelps beat Serbia's Milorad Cavic at the Beijing Olympics by a fraction of a fingertip? Phelps' margin of victory was 0.01 seconds, or 10 milliseconds, a distinction so fine it took super-slo-mo video to convince the Serbian delegation it had even happened. The next step down from the millisecond is the microsecond, or one millionth of a second. At this point, the human brain is completely out of its depth. A microsecond is to a second as a second is to 11.5 days. Next we come to the nanosecond, which is one billionth of a second—the time it takes a 1 gigahertz computer processor to execute one cycle, or the time it takes light to travel 30 centimeters. And underneath the nanosecond is the picosecond, one trillionth of a second. In this range, you're talking about "ultrafast" research. This is David Hilton's neighborhood. Picoseconds are a crucial part of vanadium dioxide research. So are femtojoules, the unit of measurement for how much energy it takes to make VO2 toggle between its transparent and metallic states. It's clear that VO2 would make a good switch—it lets light through when it's transparent, and blocks light when it's metallic. The problem has been that it takes a relatively large amount of energy to drive that change. "With this work, we have lowered the threshold energy needed to undergo the phase transition"—anywhere from one-fifth to one-tenth the energy needed in the past, Brady says. The team’s VO2 switch generates ten trillionths of a calorie, or 100 femtojoules, per bit. That low energy cost “is going to make the fabrication of these kinds of devices easier," Brady says. Richard Haglund and his team at Vanderbilt are experts in manipulating VO2. For the experiments described in the Nano Letters paper, they created a version with gold nanoparticles studded along the outside like Christmas lights. The idea "is that the nanoparticles act as antennas, focusing the light onto the VO2," Hilton says. But if you can't measure the exact point at which the phase transition happens, you can't tell exactly how much energy it takes to trigger that transition. That's where Brady and Hilton came in. In 3.3 picoseconds, light travels 1 millimeter. A picosecond is to one second as one second is to 31,700 years. In other words, it passes pretty quickly. "There's not a detector in the world fast enough to measure this," Hilton explains. "That's our specialty here is to be able to do these very fast measurements," often using what are called "pump-probe experiments." This is the realm of the ultrafast, "where 'ultrafast' is a specific word that talks about picosecond or sub-picosecond dynamics," Hilton says. In a pump-probe experiment, the pump is an ultrafast laser beam, and the probe is a second beam that arrives at the target slightly later. In this case, the pump excites the VO2 sample, and then the probe arrives to take note of what happened. Each run offers a data point; by adding up hundreds of data points, you can begin to get a picture of what is going on. "This is very much like stop-motion photography," Hilton says. "And the ironic thing about ultrafast research is it takes a very long time to put it together." Ultrafast switches aren't the only potential use for VO2. Another application, says Hilton, is in "green energy." "You could spray-coat the windows in an office building" with a vanadium dioxide solution, Hilton says. On a really hot summer day, the heat would activate the phase transition and "the windows would darken automatically," which could pay off in lower energy bills. And unlike an existing solution, silver halide, you could simply coat current windows rather than replacing all the glass in an entire building. At VO2's current transition point, 153 degrees Fahrenheit, this is still theoretical. "That's pretty hot, even for Alabama in the summer," Hilton jokes. "But if we could get it down to 105 degrees, that's very reasonable." Ever since the early 1960s, when VO2 was first created, it has clearly had plenty of potential. But there is plenty of mystery as well. "It has some aspects of the physics of something like silicon, which is a very well-understood material, and some aspects of a superconductor, which are not nearly as well understood," Hilton says. Gold nanoparticles are one way to crank down the energy required to drive VO2's phase transition. But Hilton and Brady have lots of other ideas. "We're actually starting to be able to figure out how to play with dials on this phase transition, making it do what we want," Hilton says. "The big question for me is our ability to manipulate matter and actually control these transitions, versus simply digging a material out of the ground and just using what nature gives us." Even if the VO2 switch is years away from powering your laptop, one phase of this research is already in production: Nate Brady himself. He hopes to defend his dissertation this summer and then carry on his research in a position at a national lab like Los Alamos, where Hilton also got his start. "The Department of Energy, the National Science Foundation, Department of Defense, and Department of Education are all investing heavily in nanotechnology," Hilton says. Brady is funded by a Department of Education grant, "because we know we need more nanotechnology researchers," Hilton adds. Several other UAB graduate students are funded by similar grants. "These agencies know we're going to live and die based on the next generation of scientists that we are training right now to have the next generation of ideas and to push this type of technology forward," Hilton says. "Attracting bright people like Nate into this field is good for UAB—and for our future as a country."